reported to have cost upwards of USD 8 million. Bin Salman is understood to have taken over Velaa Private Island for an extravagant two-week stay in the tiny Indian Ocean republic. And as if that wasn’t enough, the young Royal has also bought-out nearby Cheval Blanc Randheli as a base for his extensive staff and support team. As well as his numerous bodyguards and advisors, the high-profile Prince has invited a host of famous names to help him celebrate in style. Whilst the complete list of the celebrities lined up to perform at the event is unknown, both rapper Pitbull and Gangnam Star Psy were sighted boarding a seaplane with the Airport Representative of Cheval Blanc Randheli sometime last week. Singer Shakira was also spotted as she touched down at Malé Airport on Saturday with footballer husband Gerard Piqué in toe. 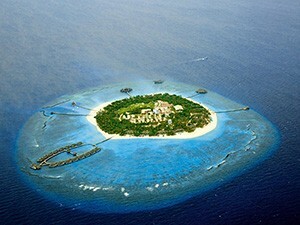 Reports from Maldivesfinest.com suggest that Jennifer Lopez and Rihanna are also expected to arrive during the next few days. Thoughts about the Saudi military intervention in Yemen will have been far from the young Defense Minister’s mind as he reclined amongst the plush surroundings of Velaa Private Island. 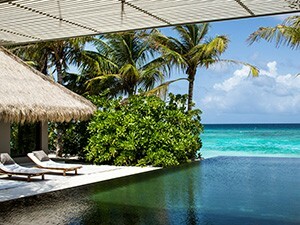 After opening its doors to discerning travelers in December 2013, Velaa has already made a considerable splash in the crowded Maldives market, emerging as a popular retreat amongst the global elite and has already served as a base for another member of the Saudi Royal Family on a previous occasion. Boasting an unparalleled service that goes way beyond that of the more traditional private island resorts in the region, the opulence of Velaa Island extends over Michelin star cuisine, one of the finest wine cellars in the Indian Ocean archipelago, the only Clarins-endorsed spa in the whole of the Maldives, world-class watersports facilities and even a private submarine. With the Crown Prince and his closest friends taking over Velaa’s 43 villas, the likes of Shakira and J-Lo will be forced to take up residence in the nearby Cheval Blanc Randheli – a similarly luxurious retreat, whose 45 tropical villas each boast a 41 foot infinity pool and an extravagant decking area which leads down to your very own private beach. 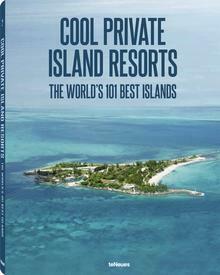 Both Velaa Private Island and Cheval Blanc Randheli are available to rent with Vladi Island Travel. Contact travel@vladi.de now to arrange your tailor-made private island adventure.